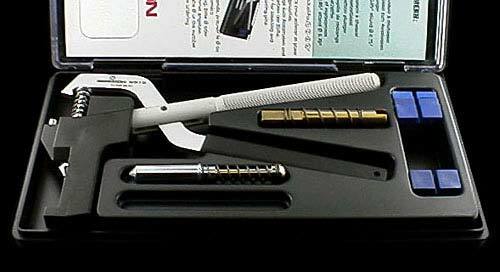 There is no doubt among the users of this tool the it is the best spring bar tool to buy. 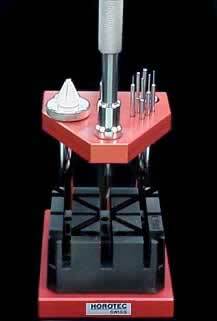 I have been using spring bars tools for over 40 years now and no other tool is even worthy of your consideration. Do not be fooled by the claims of those who simply never used this tool. Here are some comments of real users: "The small fork is exactly the same size on the FB-504 (6111) as the AF17.450/BERG-6767-F, which measures 1.20 mm; the pin is exactly the same size on each. The advantage of the 6111 is that you can get the larger spade fork in addition to the pin & small fork tips. I don't believe it's an option for the other model. The 6111 tips are double-ended, with a pin on one end and a fork on the other, which may help you decide. The collets lock the tip in place, while the other tool's tips screw in. I have both, by the way. I use the 6111 99% of the time. Sometimes you need to use two at the same time, which is why I have another." Another person writes, "I've owned the 6111 (FB-504) for years and love it, I've currently got the small fork on one end and the small pin on the other, it's a very useful tool. The large fork is useful for pushing straps out of the way in order to get to the spring bar flanges." Nickel-plated and knurled handle. Length : 140 mm. 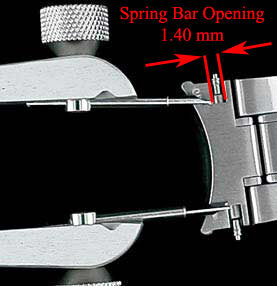 Place spring bar in the bracelet, compress the spring bar with the tool, lock it, then put the bracelet in place and release and lift the pliers. The width adjusts from 10 to 30 mm and locks by turning a screw. The tool has notches for positioning of the forks from 0 to 45 degree angle for easy of use. Stainless steel forks that come with these pliers are reversible, 1.3 mm fork opening, thickness at tip end .33 mm, and tube body diameter 1.65 mm. Same as Bergeon 6825 Pliers to Fit Spring Bars, but comes with Bergeon 6825-FF Fine Fork Points instead of the standard fork end. The 1.40 mm diameter of the forks will not fit on watches with smaller spring bar opening. Please measure the opening as shown in photo before ordering. Stainless steel forks are reversible, 1.3 mm on one end and 1.65 mm on the other. 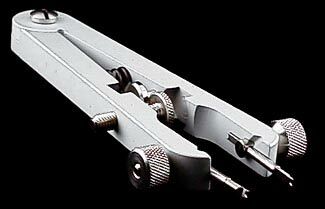 Spring bar fitting tweezers with extra fine tips measuring at 1.00 mm diameter. This tool is great for bracelets with small spring bar openings. 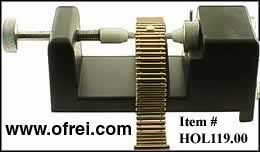 Allows to take off the bracelet from the watchcase without removing the clasp. Pair of replacement extra fine tips measuring at 1.00 mm diameter for the Bergeon 7825 Tweezers for removing and installing spring bars.. 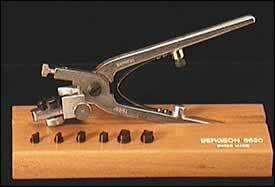 This Bergeon tool (now replaces the 6745-100) is the most complete product on the market for punching out pins or unscrewing screws on watch bracelets. Supplied with one slotted base number 6744-P, one pin holder with drum number 6745-PG-A, two bases with adjustable height number 6745-SR-20 and 6745-SR-28, one mirror disc 7745-P, one set of 10 blades number 6745-M (sizes: 2x .80, 2x 1.00, 2x 1.20, 1x 1.50, 1x 2.00 mm) and 2 Phillips number 6745-MC (size: 1.50 and 2.00 mm) on polystyrene stand number 7745-MS, and one set of 6 pins number 6745-G (sizes: .40, .60, .80, 1.00, 1.50 & 2.0 mm) on polystyrene stand number 7745-GS. The slotted base number 6744-P allows to maintain in a good position watches with leather or metal bracelet. Both bases number 6745-SR20 and 6745-SR28 allow the height adjustment. 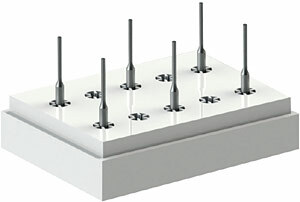 This set of six punches (.40, .60, .80, 1.00, 1.50 & 1.80 mm) for bracelet pins may be used with the Bergeon press (FB-520, punches supplied) or separately. 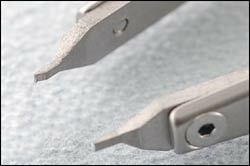 As punches sometimes break, these may be used as spares for those supplied with the FB-520. 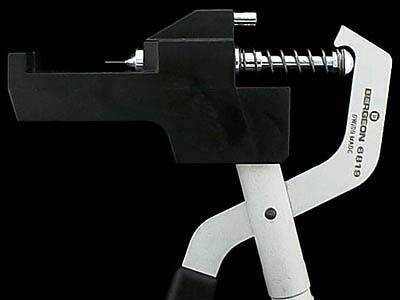 This is a very well made tool that will allow you to both drive out links in bands, and unscrew band screws. 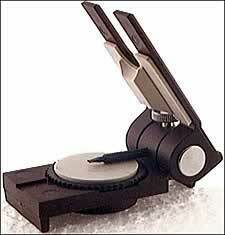 The best tool on the maket for making extra holes in Leather watch straps. Now its easy to remove links on many watch bracelets by both pushing down and pushing out the link clip with this special tip plier. 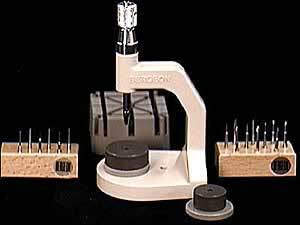 The latest Bergeon Watch Bracelet Tool for removing link-pins. 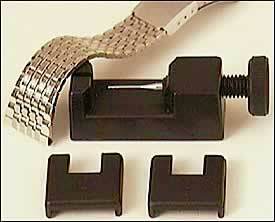 To remove screws quickly and safely, blades size is 2.9 mm and two replacements on are in the base. Screw blade size is 1.0 mm, replacements blades are available. 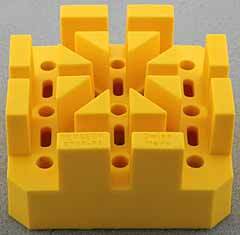 New Bergeon yellow soft synthetic material pin removing base Bergeon part number 6744-P-S. Especially made for use on precious metal bracelets, without any risk of scratches. Slot sizes: 2.2 mm, 2.6 mm, 3.0 mm, 3.4 mm, 3.8 mm, and 4.0 mm. Can be used with Bergeon 6745-100, 6745 and 6744. Slot sizes: 3.5 mm, 4.0 mm, 4.5 mm, 5.0 mm, 5.5 mm, 6.0 mm, 6.5 mm, and 7.0 mm. Yellow soft synthetic material is new from Bergeon and is especially made for use with precious metals bracelets, when you do not want to risk getting scratches on the bracelet from the standard rigid hard synthetic nylon-like material that the normal Bergeon 6744-P and 6744-P1 bases are made of. 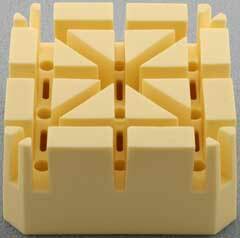 Dimensions: 53x53x26 mm. Slot sizes: 3.5 mm, 4.0 mm, 4.5 mm, 5.0 mm, 5.5 mm, 6.0 mm, 6.5 mm, and 7.0 mm.